Two Khalifa University Biomedical Engineering students--Noura Al Matroushi and Sara Timraz--arrived this week from Abu Dhabi to join the Student Innovators program at the Sheikh Zayed Institute. They will spend two months working with the Bioengineering group. 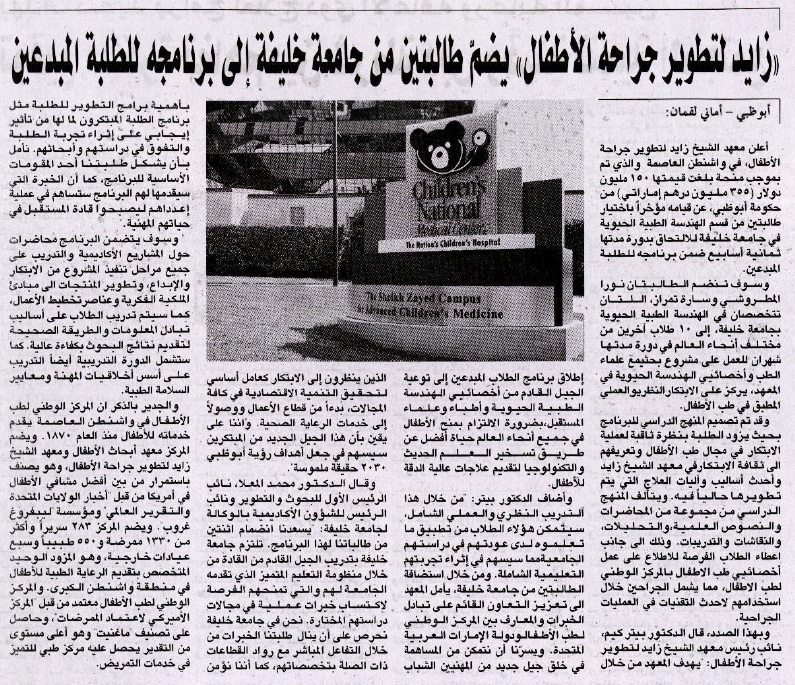 Before leaving Abu Dhabi for Washington, the girls were featured in the local media in Abu Dhabi, to talk about their story and the Student Innovators program. 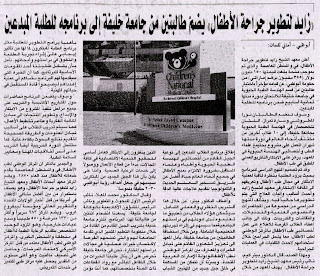 Story about UAE students joining the Student Innovators program in the Arabic daily Al Bayan. “By hosting the students from Khalifa University, the institute hopes to build even greater knowledge sharing and transfer between Children’s National Medical Center and the UAE," said Peter Kim, MD, the institute's vice president. "We are delighted to be able to help create a new generation of young professionals who consider innovation an essential route to economic development in any field from business to health care, with a special focus on how innovation can benefit the world’s children." While here, the innovators participate in a wide range of lectures, assigned readings, case analyses, exercises, and discussions, as well as opportunities to observe first-hand the work of Children’s National pediatric experts, including shadowing surgeons in the operating room. We will provide regular updates about all of the innovators' experiences via our own blogging student innovator Larry Kim.